The China Cetacean Alliance is a coalition of international animal protection and conservation organizations, comprising the Animal Welfare Institute, Endangered Species Fund, Environment & Animal Society Taiwan, Hong Kong Dolphin Conservation Society, Kuroshio Ocean Education Foundation, Marine Connection, Nature University and Whale and Dolphin Conservation Society. 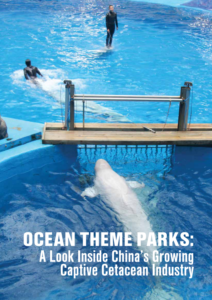 The Alliance aims to raise awareness of the welfare issues associated with the capture of free-ranging whales, dolphins and porpoises and their subsequent holding in ocean theme parks in mainland China. While the rest of the world is eliminating dolphinaria industry, China has just started the business. With over 50 operating and constructing and operating dolphinaria. Read the following report and videos to learn the problem of dolphinaria. Also read our press release 《 Stop fooling us with the name of conservation, Chimelong Ocean Kingdom》.